EXTINCTIONS CHOICE - Mosasaur Tooth in Jaw! Here is a fabulous fossil tooth from a Mosasaur. 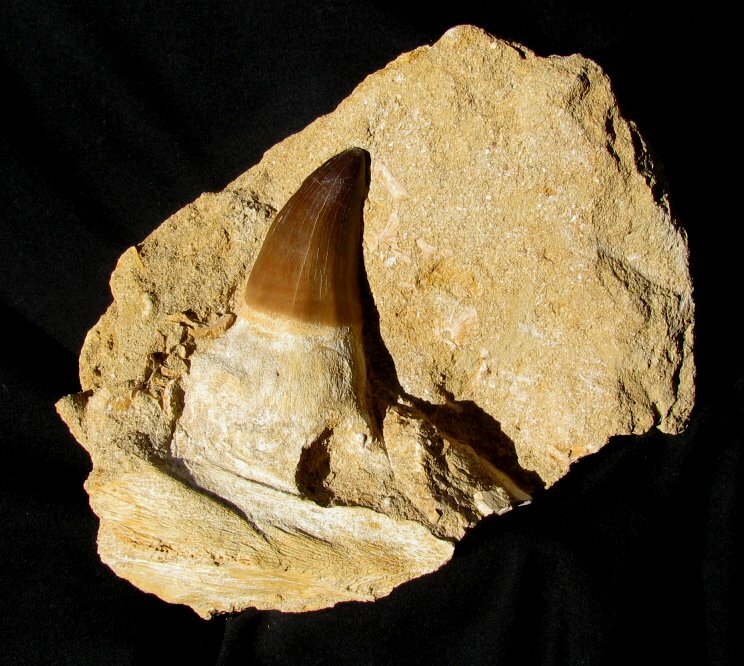 This is a very large Mosasaurus anceps tooth from the Cretaceous of Morocco. This robust marine lizard tooth is very inflated and exhibits fine detail. The corrugated enamel of the tooth is beautifully preserved, and the very tip of the tooth displays hardly any natural wear from use. The tooth is still embedded in a large section of jawbone, which is quite unusual. The fossil has wonderful color and contrast and is still embedded in a large block of sandstone - natural, not composited. This is a very collectible example of a large jaw section with tooth from this ferocious marine reptile from the "Jurassic World" movie.